"This is my adaptation of grilled cabbage with a bacon twist. I like to use peppered bacon, so I don't pepper my cabbage; it's up to you." Fill the hole created from coring the cabbage with butter, salt, and pepper. Roll bacon slices and stuff into hole in cabbage. 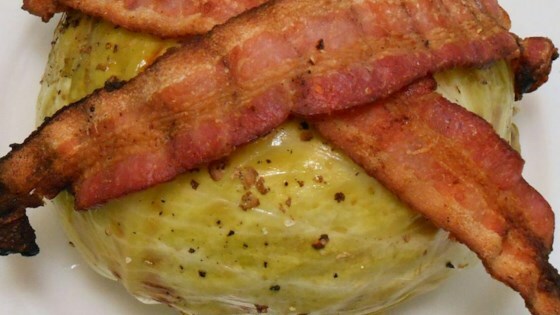 Lay any leftover bacon slices over the top of cabbage. Wrap the whole cabbage in aluminum foil. Cook cabbage on preheated grill until tender, 45 to 50 minutes. Remove bacon from cabbage and cook on the grill until crisp, 5 to 7 minutes; crumble and sprinkle over cabbage. Had to make it in the oven...grill was buried. Quartered it, cored it, covered it in bacon and roasted at 400 degrees for 50 minutes.Soooo good!